On Sunday, Husband went out of town for a few days. I guess his absence left my heart feeling empty, because this salad is full of hearts! Hearts of palm and Hemp Hearts. 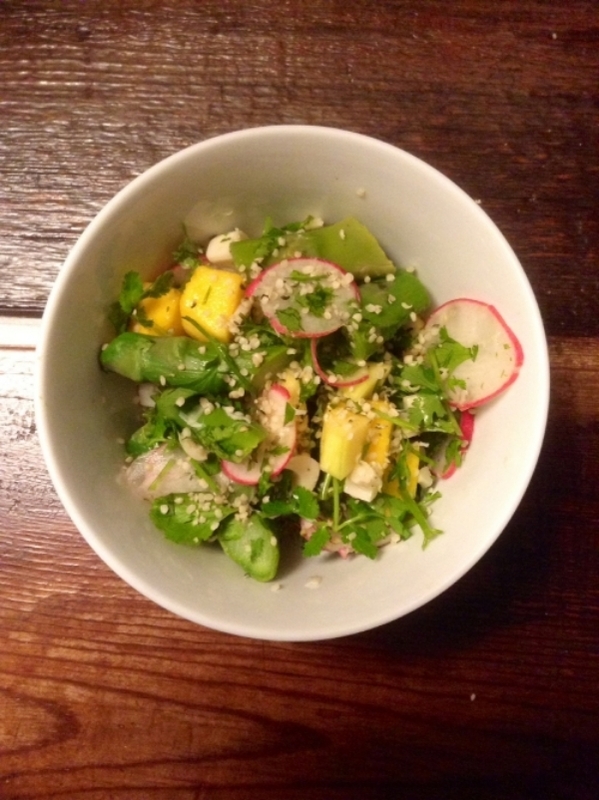 If I had to describe the taste of this salad I would say it's spring-to-summer. The flavors are generally very springy but the lime juice and mango give it a little summer kick. Perfect for late May! 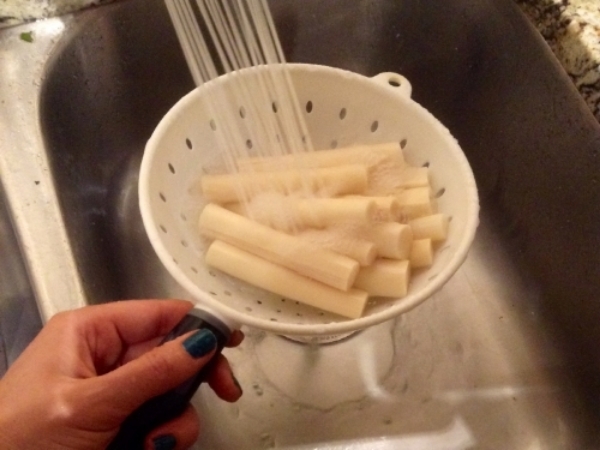 Drain and rinse the hearts of palm (to remove excess sodium). Chop into 1/2-inch segments and separate the rings with your fingers. I forgot to snap a picture after I chopped them up. Oops! Next chop the cilantro, asparagus, mangoes and radishes. It's hard to tell in the photo, but this organic asparagus was GIANT. Optional step: Taste test the mango. More than once. I use my mandolin to slice radishes. I prefer them to be super thin so they aren't quite so strong. Bring a pot of water to a boil and add the cut asparagus. Let cook for 2-3 minutes (or longer if you have teenage mutant ninja asparagus like I did); drain and rinse with cold water immediately. Mix lime juice, Dijon mustard, olive oil and vinegar together. Taste and adjust ingredients as desired. Mix all prepared ingredients and toss with dressing until coated. Then, just top with Hemp Hearts before devouring. Enjoy!